On a warm August night in 2010, undrafted free agent wide receiver Victor Cruz burst onto the New York City scene. The Giants and Jets were facing off in their annual Snoopy Bowl, opening their new shared MetLife Stadium. The physical matchup, which saw Giants quarterback Eli Manning suffer a vicious cut on his forehead requiring 12 stitches to close, was the coming out party for Cruz, who would quickly become a Giants legend. After a strong camp, the rookie out of the University of Massachusetts tore into Rex Ryan’s defense with six receptions for 145 yards and three touchdowns. Even though it was the preseason, Cruz displayed athletic ability, body adjustment, ball skills, and what TV analyst Jon Gruden deemed a “sick catch”, while leaping over a Jets defender and to complete a one-handed grab. The former two-star recruit out of New Jersey’s Paterson Catholic High School was generating a ton of buzz, but was soon forgotten when he suffered a season-ending hamstring injury in the third game of the regular season. As an undrafted free agent, it would be a long journey to once again prove his worth and earn his keep on the roster, but if there is one word that defines Cruz it’s resilience. The 2011 season was upon Big Blue and Cruz was not long forgotten. He recorded three catches for 110 yards and two touchdowns in Philadelphia to help lift the Giants to a 29-16 Week 3 victory. Throughout the 2011 season, opposing players and sportscasters alike were all asking a similar question: How was this Victor Cruz kid not drafted? No play sums up the importance of Cruz more than the 99-yard touchdown catch in the Christmas Eve game against the Jets. The Jets were trying to secure the second Wild Card spot in the AFC and the Giants were competing for the NFC East crown in a Week 16 matchup for the ages. The winner had a significant chance to extend its season, while the loser would have to read and hear about their failures in the New York media. On third down with 2:30 left in the first half, Manning found Cruz from his own end zone on a 10-yard out route and Cruz broke free from would-be tacklers, accelerating up the sideline for six points. I’d argue the impact of that play sparked the ascension of the 2011 Giants, leading to the franchise’s fourth Super Bowl title and marking the decline of the Rex Ryan era with the Jets. The controversial head coach had led the Jets to consecutive AFC Championship Games and could never recapture that magic. To say Cruz was pivotal in the Giants title run is an understatement, as he finished the season with 82 receptions for 1,536 yards and nine touchdowns. He was vital to Manning’s league-leading seven comeback victories, while teaming up with Hakeem Nicks and Mario Manningham to form one of the most affordable and formidable receiving corps in 2011. After a solid 2012 Pro Bowl season, Cruz signed a five-year $43 million deal that featured a $9.5 million signing bonus in 2013. 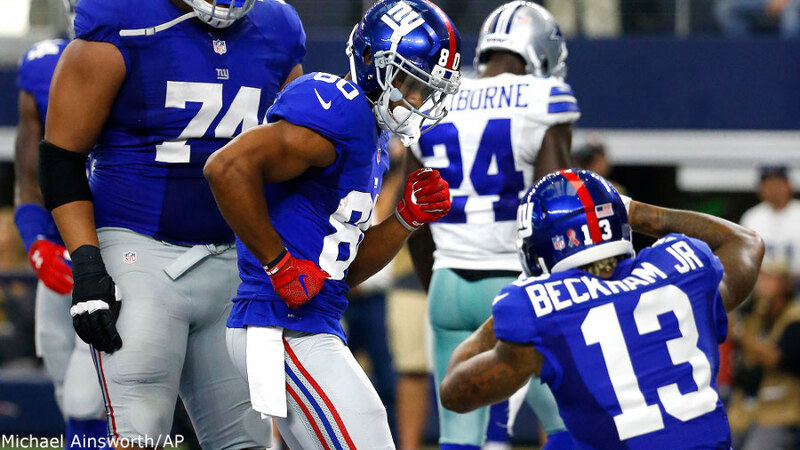 Cruz proved his worth in Week 1 against Dallas securing three touchdown catches for more than 100 yards, but the offense struggled under offensive coordinator Kevin Gilbride all season and the Giants sputtered to a 7-9 record. The 2014 season was a one to forget for Cruz. The Giants were shutout in Week 6 against the Eagles, but there was a bigger loss than as Cruz tore the patellar tendon in his right knee, which initiated a 26-game absence for the star wide out. During those 26 games, the Giants saw an explosive ascension out of 2014 first-round pick Odell Beckham Jr.. Cruz did nothing but take the young receiver under his wing and embrace the older brother role for the betterment of the team. Cruz suffered multiple setbacks as he attempted to return to the field, which resulted in him missing the entire 2015 season with a calf strain. The unfortunate aspect of dealing with a significant injury like a patellar tendon tear is that the rest of your body needs to compensate for that injury, which forces excess stress on the synergistic muscles and ligaments. Despite the setbacks, he found his way back onto the field in 2016 wearing Giants blue, while playing predominantly on the outside, with rookie second-round pick Sterling Shepard playing about 80% of the snaps in the slot. It became evident that Cruz lacked the explosiveness and quickness that once made him a shining star in the spotlight of New York. The fear became a reality for Cruz when the Giants released him on February 11, freeing up $7.5 million in cap space. The Giants also released veteran running back Rashad Jennings, freeing up another $2.5 million in cap space. The extra $10 million in cap space can be allocated toward upgrading skill positions on offense or keeping key parts of the Giants highly-ranked defense from last year, including unrestricted free agents DE Jason Pierre-Paul and DT Johnathan Hankins, who will garner plenty of attention on the open market. The Giants will also have to address the WR position this offseason. New York predominately lines up in 11 personnel, so having three competent receivers is imperative. Cruz went out in a fashion that many would expect, displaying nothing but class and thanking the Giants organization for the opportunities they offered. Cruz, now 30, is two and a half years removed from his patellar tendon surgery, however, despite only missing one game this season, it is not crazy to say we may have seen the last end zone salsa dance. There are few players that embody the core values of their respective NFL franchises like Cruz did with the New York Giants. His story is one of the great and unlikely stories of the NFL. Cruz rose from the streets of Paterson, New Jersey to Super Bowl stardom for his local team. He set an example to emulate for young children in disenfranchised areas, while being a role model and partaking in local philanthropic efforts to benefit others. Salsa is not just a Latin dance or a quality alternative to guacamole. No, it also meant Big Blue touchdowns and I know Giants fans will miss the dance come football Sunday. It is uncommon to see such a high-profile receiver in a city like New York act as professionally and in such a humbling manner like we had the pleasure of seeing with Cruz. If he shows half the resilience outside of football that he possessed while being a player, he will find success. Although Cruz was rightfully released by the Giants, he will forever be a Giant and I am proud to have had the pleasure of watching him rise to stardom. Nick Falato wrote this article. Follow Nick on Twitter @nickfalato. Please subscribe to our Podcast, view our Youtube channel, bookmark our site, follow our Twitter account, LIKE us on Facebook, buy 17 Drives from our Amazon link, see our Instagram, and learn more in our Glossary. Victor Cruz will be missed and always remembered for what he did for the organization after bursting onto the scene as an undrafted rookie. Perhaps between his recent injury troubles and the rise of Odell it is easy for some Giants fans to forget how good he truly was and what he meant to the offense in his prime. I’ll never forget watching that breakout pre season game, and thinking to myself ” Holy ****, he might actually be good” as he torched the Jets, even after they started double and triple teaming.Without question the pinnacle VC moment has to be the 99 yd TD against the Jets in 2011 that kept the season alive and ultimately can be pinpointed as the starting point of the that Super Bowl run. Parting ways is tough but it is the right time for both sides. His unprecedented rise will always be appreciated by true Giants and NFL fans alike. You know he is respected when EAGLE fans applauded out of respect when he was being carted off with, what later would be turn out to be a career altering knee injury, nonetheless his greatness not forgotten . And his salsa will greatly missed. It was great having him on the team! Best of luck Mr. Cruz!